There are many great resources available, such as books, videos, and classes, to help us learn different art techniques. 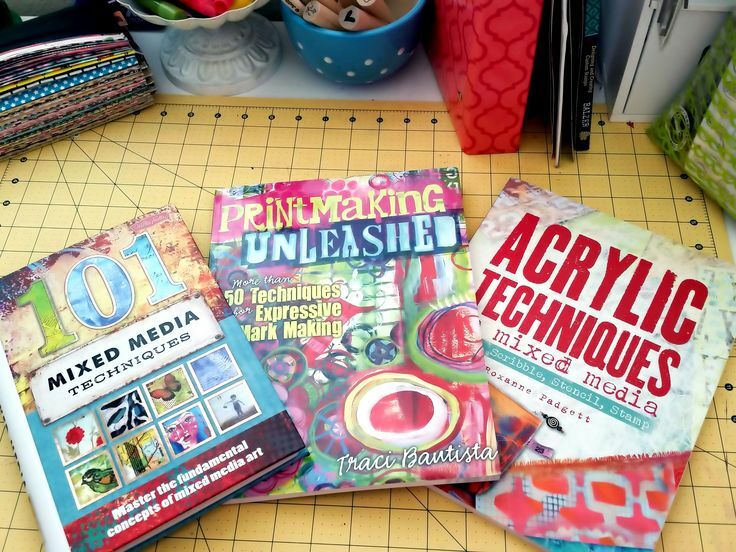 While they definitely all have their place, as a lover of books I can’t help picking up new ones that catch my eye, especially when I have a coupon from the local craft store burning a hole in my pocket! These are just a few of my favorite. They offer a good mix of useful techniques regardless of your skill level. Books listed below, left to right. This week’s DLP challenge was “Splatters & Drips”. For the tip in I used Dr. Martin Bombay India Inks on semi gloss photo paper. 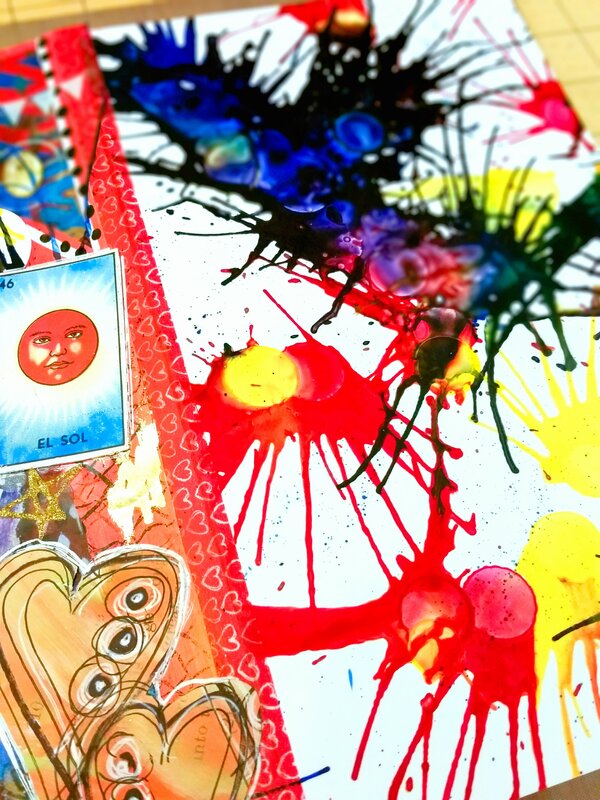 I created the splatter effect by dripping ink onto the photo paper and blowing on it through a drinking straw. The middle page was collaged using a base of Dina Wakley acrylics, they are my FAVE, and a crackle texture stamp by Darkroom Door. 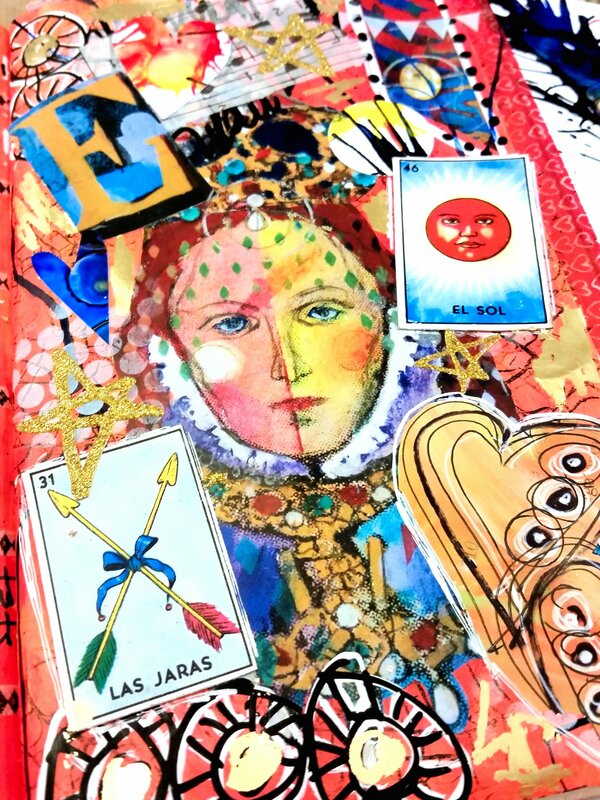 Using an image of Queen Elizabeth I cut out of the Sept/Oct issue of Somerset Studio Magazine as a focal point, I added pieces of happy mail received from fellow artists and misc bits that I had in my stash to add layers and dimension. A few doodles helped bring it all together. 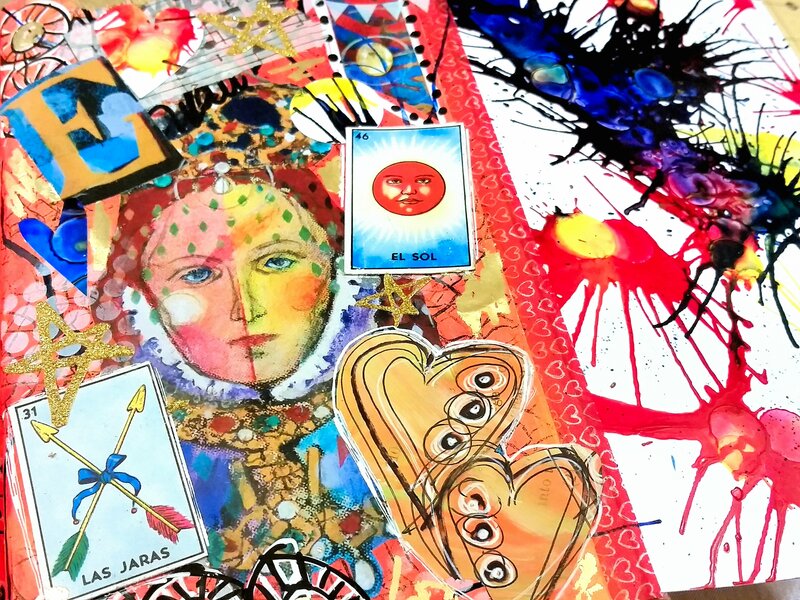 Thanks to my good friend, Jana, who told me about The Documented Life Project, I’ve been participating and completing the weekly art journal challenges since June. It has been an amazing journey that has prompted much personal growth. Being a part of the group and soaking up the collective creative vibe from everyone has been a joy. This is a look at Week 38. Our challenge was to incorporate a feather, in any form. This particular challenge really embodied what DLP is for me. It celebrates the oopsies and the uh-ohs of my artistic journey. It celebrates the opportunities for growth that they offer, overcoming my need for it to be “perfect” and learning to just enjoy the process of creating something that is uniquely my own. This month I’m doing 30 Days of Lists for the second time; my first round was in March. I don’t have time to scrap every night or do an entire art journal layout each day, so a short list that I can do in 15 minutes every day for a month is a fantastic creative outlet. Registration opens each Feb and August for the rounds of listing in March and September. That gives you some time to lay the base for your list. It can be anything from a little notebook where you jot down your lists, to a digital version created with one of the many photo apps available. There are no wrong ways to list! 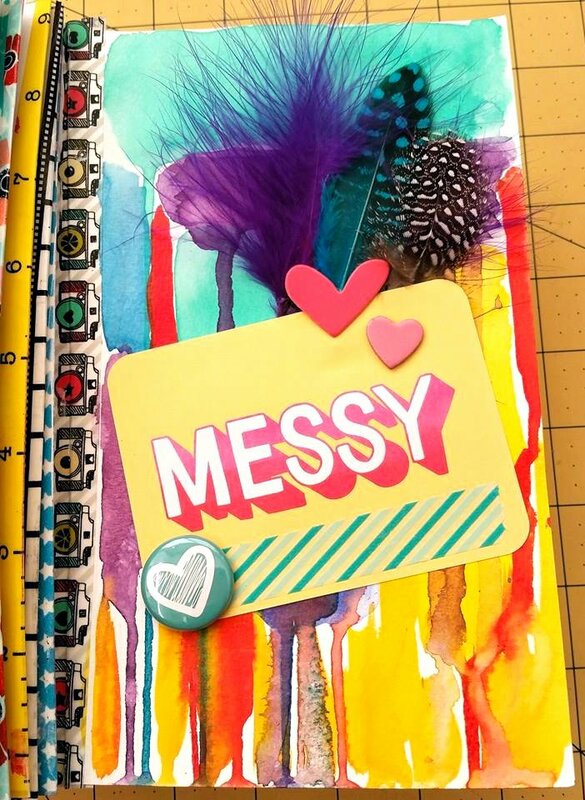 For this round I created my own mixed media style cards and cut them down to fit Becky Higgins photo pocket pages design F so that I could slip the pages right into the back of my scrapbook album. 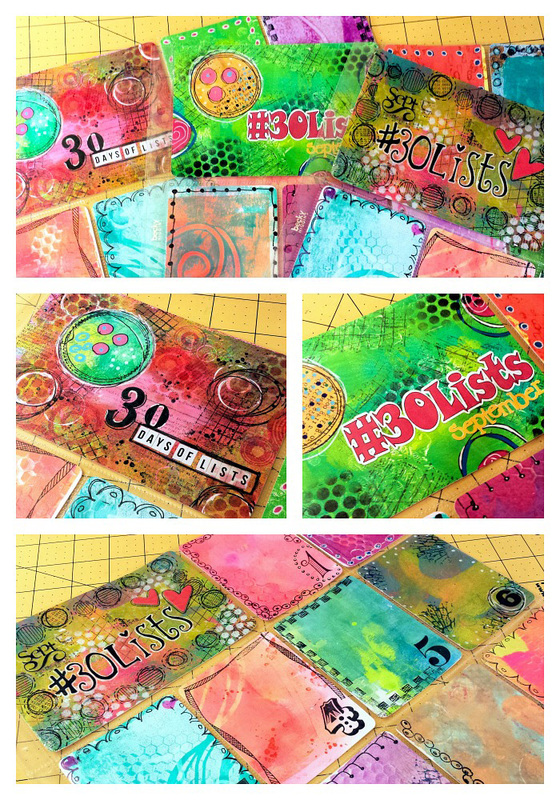 If you’ve never listed before, I invite you to check it out http://30daysoflists.com/. Hope to see you in March!